For Franke Coffee Systems, enjoyment means perfect coffee prepared with ease. With Franke’s line of fully automatic espresso machines, making a delicious beverage is both simple and straightforward! 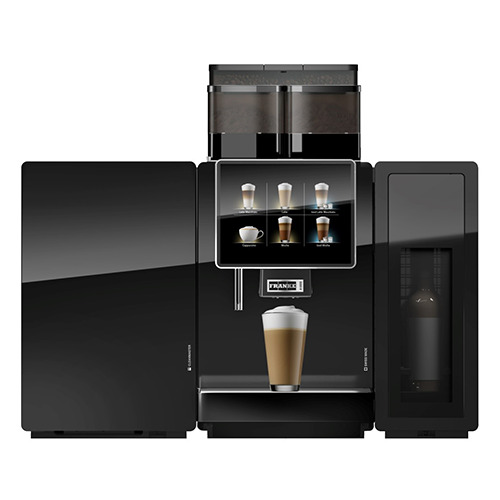 Franke Coffee Systems is one of the world’s leading suppliers of coffee machines, used and trusted in tens of thousands of locations across the globe, from convenience stores and quick-serve restaurants, to trendy cafés’ and restaurants. Delicious coffee makes for wonderful moments; and Franke Coffee Systems is committed to providing solutions for coffee preparation in the kitchen and beyond. The A1000 was created to give your guests their very own little moment of luxury and serves the highest drink capacity. iQFlow™ technology integrated as standard allows for top in-cup quality in every cup, giving every customer the best coffee experience. Add a flavor to your beverage from the six syrup flavor station. The A1000 features a new intelligent refrigeration unit and up to two types of milk with two parallel refrigeration circuits, including dreamy FoamMaster™ milk foam. The 10.4-inch Multimedia Touchscreen provides a user-friendly menu navigation, with HD-quality video with sound, perfect for showcasing your brand and promotions. The fully automatic cleaning process keeps your A1000 sparkling clean with a simple effort that allows more time for creating customized espresso-based beverages.